It’s so hard to believe that today is two years to the day that Peru 19 landed in Lima and now we have only about a month left!!! Even crazier to believe is that Peru 23, the group that replaces us in our sites, just arrived in-country to start their own three-month Pre-Service Training. As a nice WELCOME gesture, Mike, our incredibly talented video guru, put together this little diddy with tons of useful advice. I think anyone who watches this video can feel not only the love and camraderie that exists between us as a group, but also the amount of fun we’ve had these last two years! That’s the most I can wish for future groups– happiness, a sense of purpose and creating bonds that will last a lifetime. 19 Ways to Survive the Peace Corps in Peru from Mike K on Vimeo. A few weeks ago I got the opportunity to do one of the coolest things I’ve done outside of anything related to my volunteer work. But first—a confession: when this years Vacaciones Utiles ended in late February, I consciously decided to take an extended work break. I was so exhausted and overworked after teaching summer school all by myself that I didn’t even have time or energy for the little things that I love about my town and my host family. All of a sudden, I became very aware of the importance in accepting lunch invitations from my neighbors, or sitting down to watch “Frozen” with my host niece (beautiful movie, btw). It wasn’t like I lounged around in my PJ’s all day; that gets old after, oh, 3 days. Our women’s workout group is still a top priority every Tuesday and Thursday, as well as training for this year’s half marathon in Lima with my best friend in site, Daniela, and a slew of minor commitments here and there. Back to my unexpected adventure with the Gloria Guys. So there we were, my friend Pochita and I, on a Tuesday night setting up for our workout class. Out of the shadows, we see two well-dressed gentlemen in crisp collar shirts and slacks approaching us. “Are you ladies from here?” they asked. Initially I was taken aback by their determined approach, and also, their exceptionally dapper attire. Mis Olmanos are many wonderful things, but ‘dapper’ is not one of them. While I remained mentally preocuppied with their fashion, Pochita answered for the both of us. “I am, but she’s not”, she replied while signaling to me. Then they asked “Do either of you speak English? We’ve been told there’s a Señorita who speaks English.” Snapping back into real time, I presented myself as said Señorita. It turns out the men are agricultural engineers with Grupo Gloria, one of Peru’s biggest and most successful companies. They are starting an immense sugarcane planting operation nearby and Olmos has become the project headquarters. Since it is still in the early stages of implementation, an independent consultant from Britain was brought in to survey and revise their work plans. The translator they hired quit on them after the first day and they were desperate for anyone who could help them communicate with Brennan (the Brit.) Part of me was interested in helping them out as they seemed to be in a tight situation and part of me was just nosy curious to learn more about the project that will change the landscape of the region in its entirety. And would you look at that? My schedule is clear! I heartily agreed to join them the next morning at 6:30 a.m. Walking over to the hotel-turned-headquarters, I wasn’t really sure what I had signed up for, but as with everything else in this life…you just roll with it. After a hearty breakfast, Brennan, two project managers and I set off to the future sugarcane site. It was then I finally understood the magnitude of the project. From inside the comfort of the air-conditioned 4×4, I watched as the hills around Olmos disappeared and were replaced by, well, nothing. An hour and half later, we could have been in the middle of the Arabian desert and I would have been none the wiser (really. Brennan has lived in Saudi Arabia and said “this reminds me of the Arabian desert.”) It’s hard to picture these massive sand dunes being replaced with greenery and sugarcane but I’ll chalk it up to the modern marvels of agriculture. And, as I learned, it really is a marvelous process. Through the translating, I learned so much about the actual genius and logistical miracle it takes to put something like this together. Everything from technical specifications of heavy machinery to the exact planting distance necessary to ensure maximum crop yield, I translated it all. From Brennan’s conversations with project managers I learned about negotiating contracts with landscaping companies. From his conversations with civil engineers, I learned about road-building specifications and how to determine the tonnage that any given road can sustain. From his conversations with the planting manager, I learned about every machine used in the planting process, varying irrigation systems, plant beds, fertilizer, the current state of the international sugarcane industry, etc. Anyone who knows what a nerd I am can just imagine how this crash course in agriculture made me absolutely giddy! And it wasn’t only about the crazy amount of knowledge I was acquiring every day. For a week, I felt like I was part of this massively important project. Every day, the team would gather for breakfast and off we’d go, on to the adventure of the day. 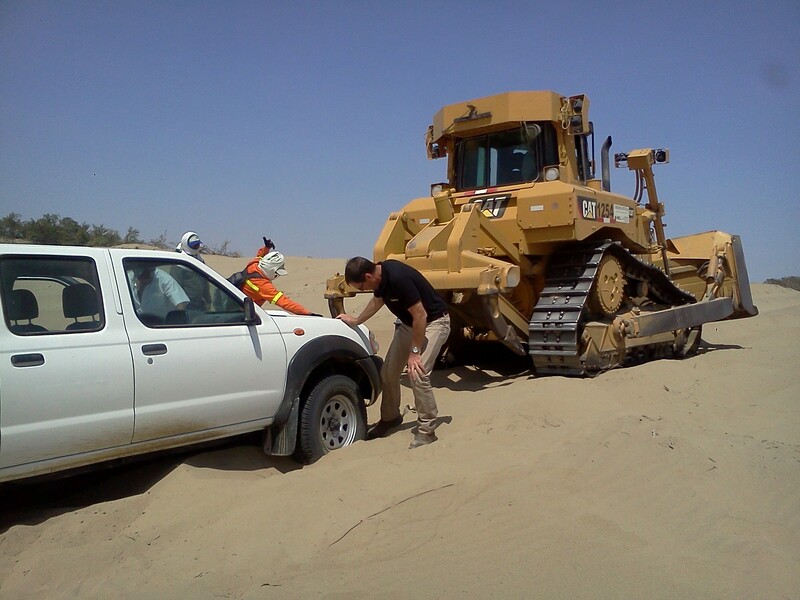 Just me and the guys, in our 4×4, sharing sunscreen to protect our skin against the intense mid-day sun or working together to get the truck out when the tires got stuck in the sand. Ok, in all fairness, they worked together while I stood by and took some pictures. One day, the big company boss was visiting and wanted to see the progress made on various parts of the project, which meant visiting different points within about 15,000 hectares. It was a long day filled with hopping into the truck, driving half an hour, hopping out, conversing, hopping back in, on to the next site, hopping back out, translating some more, driving to the next site, and so on. This started at around 7am and lasted way after our designated 2pm lunch time. It wasn’t until 6pm that we headed back into Olmos for a meal. At one point during the ride, we were so hungry, I emptied the contents of my Longchamp bag to see if I had anything edible. Luckily, I found some candies I gathered at the last baptism I attended. The guys were grateful! All in all, it was a great experience and I’m glad I agreed to help them out. Not only did I go on some unexpected adventures in the desert that surrounds Olmos, but I also got to meet some brilliant, interesting, successful people. It was one of those moments where you realize you would have never had the opportunity to do something like this at any other time in your life. Just because I can speak two languages, all of a sudden I’m part of this super important team working on a groundbreaking project. When else would I ever be hanging out with global sugarcane experts or the nation’s top engineers? One of the things I really took away from this were the inspiring conversations I had with Brennan about his extensive international career that has taken him from Swaziland to Papua New Guinea and everywhere in between. It seems fitting, as I make decisions regarding my own future. I also love that I made new friends in town, and whenever I see the guys around they always stop to saludar and chat for a bit. Are you wondering if I made tons of money off of this week-long gig? I bet you are. The answer is a big fat NO. As a Peace Corps volunteer I cannot accept payment for anything I do in Peru, especially if it is from a private company. So that’s kind of a bummer, but the great thing is Miguel, Daniela (co-leader of our women’s workout group) and I are looking to see if they can make some sort of donation to buy us some new equipment like yoga mats or resistance bands.